This is the first scholarly monograph marking the social justice turn in technical and professional communication (TPC). Social justice often draws attention to structural oppression, but to enact social justice as technical communicators, first, we must be able to trace daily practice to the oppressive structures it professionalizes, codifies, and normalizes. Technical Communication After the Social Justice Turn moves readers from conceptual explorations of oppression and justice to a theoretical framework that allows for the concepts to be applied and implemented in a variety of practical contexts. 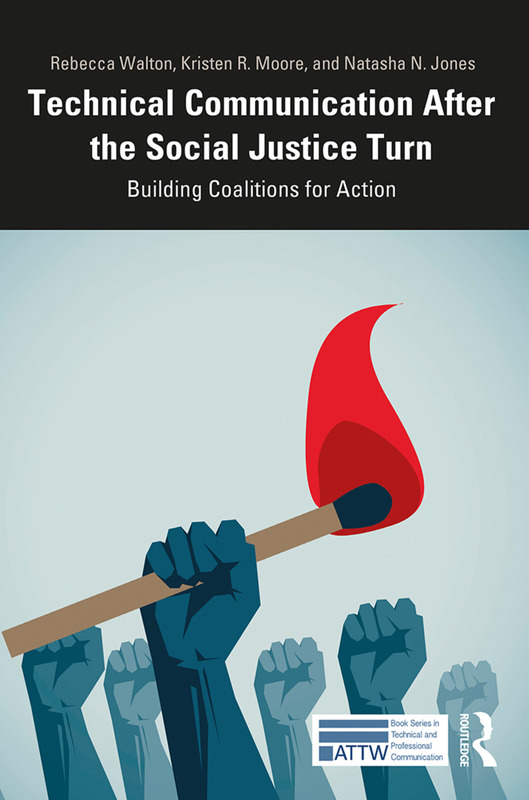 It historicizes the recent social justice turn in TPC scholarship, models a social justice approach to building theories and heuristics, and presents scenarios that illustrate how to develop sustainable practices of activism and social justice. Its commitment to coalition building, inclusivity, and socially just practices of citation and activism will support scholars, teachers, and practitioners not only in understanding how the work of technical communication is often complicit in oppression but also in recognizing, revealing, rejecting, and replacing oppressive practices. "This book opens vital conversations and makes fascinating theoretical interventions into the 'social justice turn' in technical communication. Anyone in this field with more than a fleeting commitment to social justice must carefully consider Walton, Moore, and Jones’ insights on intersectionality, coalition, power, and privilege." Dr. Rebecca Walton is an associate professor of technical communication and rhetoric at Utah State University, USA, and the editor of Technical Communication Quarterly. Her co-authored work has won multiple national awards, including the 2018 CCCC Best Article on Philosophy or Theory of Technical or Scientific Communication, the 2016 and 2017 Nell Ann Pickett Award, and the 2017 STC Distinguished Article Award. Dr. Kristen R. Moore is an associate professor of technical communication in the Departments of Engineering Education and English at University at Buffalo, USA. Her scholarship has been published in a range of technical communication journals and has been awarded CCCC Best Article on Philosophy or Theory of Technical or Scientific Communication in 2015 and 2018, the Nell Ann Pickett Award, and the Joenk Award. Dr. Natasha N. Jones is an associate professor at Michigan State University, USA, and the Vice President for the Association of Teachers of Technical Writing (ATTW). She has published in several journals and been recognized for her scholarship, including being awarded the Nell Ann Pickett Award and a CCCC Technical and Scientific Communication Best Article Award in 2014 and 2018. The ATTW Series in Technical and Professional Communication publishes interesting and useful work in a wide range of topics related to technical and professional communication (TPC), including but not limited to the following: assessment of TPC programs, content management systems, globalization of TPC, human-computer interaction, intercultural communication, health-care and medical communication, pedagogy of TPC, publication management, risk and crisis communication, service learning in TPC, technical and professional editing, translation of TPC, usability/user-experience and accessibility studies, visual communication, and web design and development.